The general perception of cancer is that you get it, you treat it, and then you’re cured. Anyone who has had cancer knows things aren’t quite so easy; cancer treatment can leave you with long-term side effects and it’s often impossible to know whether you’ve been cured or not. There are also ‘chronic’ cancers that can look to those who aren’t in the know like they’re not cancer at all. 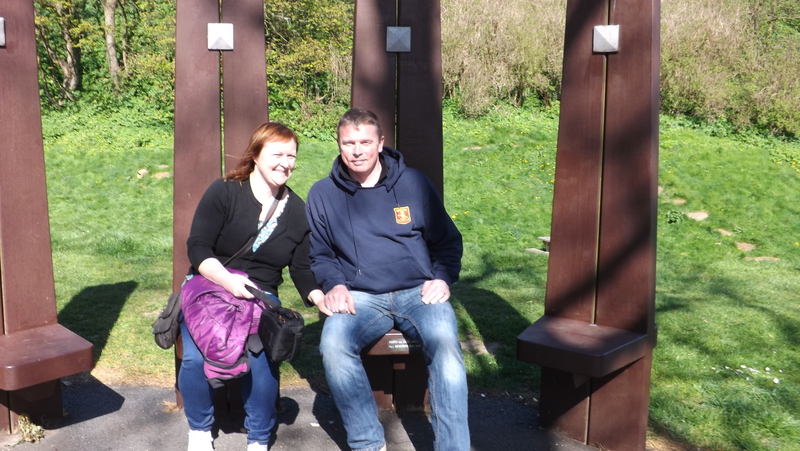 In our latest blog, Sarah writes about living with Chronic Myeloid Leukaemia (CML), a blood cancer which requires daily treatment. Sarah was one of the first women in the world to give birth while on Glivec, a drug which has revolutionised CML-treatment but which can have difficult and disturbing side-effects. Take a read and let us know what you think. Whatever your health status, we’re sure you’ll agree that Sarah has an important story to tell. I discovered I had leukaemia by accident. I was 30 years old and was at the peak of my fitness, running 5 miles every other day and doing aerobics twice a week. I was juggling an NVQ Level 2 Gym Instructing course with being the single mum of a toddler. I had also recently recovered from severe post-natal depression after the birth of my first child three years earlier and was getting over a marriage break up. But my new boyfriend, Kevin, had just moved in with me and we had started to make plans for a future together……things looked really good. As I had been on medication for depression it was a routine procedure to check my liver count. At one GP appointment, the nurse wasn’t sure what box to tick on the blood-screening test so she decided to tick all of them and my bloods went off for analysis. A week later I was told to go to my local hospital and have a blood test done with a haematologist. The doctor indicated that there could be a problem but advised me to go back to my GP in a month for another blood test. A couple of days after I did that, I received a phone call telling me to go to the hospital the next day. When we got to the waiting room all I could see were leaflets for HIV and cancer. After a long wait, I was called into see Professor P. I had some more blood tests done and he checked my spleen. He asked us to return in an hour so he could analyse my blood. When we returned, he told me that I likely had Chronic Myeloid Leukaemia (CML). My world crashed around me. Nine months before I was diagnosed, I lost my Nana to non-Hodgkin lymphoma and Kevin had lost he dad to cancer the year before, so to be told that I had cancer too was a huge shock. On the other hand, we were able to connect some dots. All of a sudden I understood why I had been a lot more tired than usual, and why I was experiencing shortness of breath when walking up stairs. I had also been getting an upset stomach and losing weight. Having CML was described by the doctors as similar to a long-term chronic illness, like diabetes. But they also mentioned that there were treatment options such as a bone marrow transplant if oral medication did not control the disease. I was told that was very rare for a woman my age to develop CML as it mainly appears in men over 50. I started a short course of Hydroxyurea before the long-term treatment of Glivec was started. Glivec (Imatinib) is a tyrosine kinase inhibitor (TKI). It stops the tyrosine kinase enzyme that causes the abnormality in the bone marrow that leads to the mass production of immature white blood cells. Glivec is very much the first in a new type of targeted therapy and many new treatments for other cancers are aiming to follow its design. When I started Glivec, I often felt sick after taking it and I had re-adjust my meals. I had to have large bowls of pasta in the evening just to keep the tablets down, and if I drank cola or tea it would come straight back up. I started to gain weight and went from size 10 to size 14 within a couple of months but I didn’t feel like exercising as the Glivec also caused bone pain. Telling family and friends about my diagnosis was difficult. My daughter was too young to understand, although she knew that I wasn’t well. Telling my dad was particularly hard as he lives in New Zealand so the distance seemed even greater, especially as we both just wanted to be able to give each other a hug. Some of my friends thought I was being selfish when I wasn’t able to socialise as much as I had done and some friendships have not lasted the distance. My most important relationship, however, has lasted and that’s with my husband Kevin. Six months after my diagnosis I started feeling very tired. I also had sudden urges for food like donuts and noticed that smells were becoming stronger. I did a pregnancy test that was positive but when I informed the hospital they told me that having the baby would be a gamble; there hadn’t been many successful pregnancies on Glivec anywhere in the world. We decided to chance it, and it was agreed that I would come off treatment to give my baby the best chance of survival. Everything ran quite smoothly until 23 weeks into the pregnancy. My white cell count started to rise and I was advised to restart treatment, but the lack of information on Glivec and pregnancy was stressful. We didn’t know how safe the drug was for the baby and we worried that the baby’s brain development could be affected. With so little information go on, I spent an agonising week wondering what to do, and what would be best. I eventually restarted Glivec and, six weeks before my due date, I went into spontaneous labour. Our healthy son, Matthew, was only the fourth baby born worldwide on Glivec. Following Matthew’s birth, Glivec started to impact negatively on my life. I ballooned from a size 14 to size 22, and I found walking hard. I had drenching night sweats, joint pain, heartburn, itchy skin and felt really down. Eventually it was decided that I could try a different drug called Tasigna. Tasigna is taken on an empty stomach, so I was able to cut the heavy meal at night and, as the weight dropped off, I found getting around a lot easier. Ten years on from my diagnosis, I am far from as fit as I used to be but I am a lot happier with myself than I was. Having lost 70lbs (five stone), I am now about a size 14. The night sweats still happen but they are not as bad. I still have days where I suffer with fatigue and joint pain and it’s known that the long-term use of TKIs can cause heart damage and diabetes. I try to watch what I eat and do some exercise when I can. I often wonder what the future will hold for me. CML has changed my life drastically; I gave up on my dream of being a gym instructor and I often feel lost about what to do once my kids are older. I have four-monthly blood tests to check that the Tasigna is still working and, so far, I am in “molecular remission”, meaning that CML cells are undetectable in my blood tests. The only cure for CML is a bone marrow transplant, which is a high-risk procedure. On bad days, I often wish I could be cured so I don’t have to think about managing this illness for the rest of my life. On other days, though, I know I am lucky to be alive.